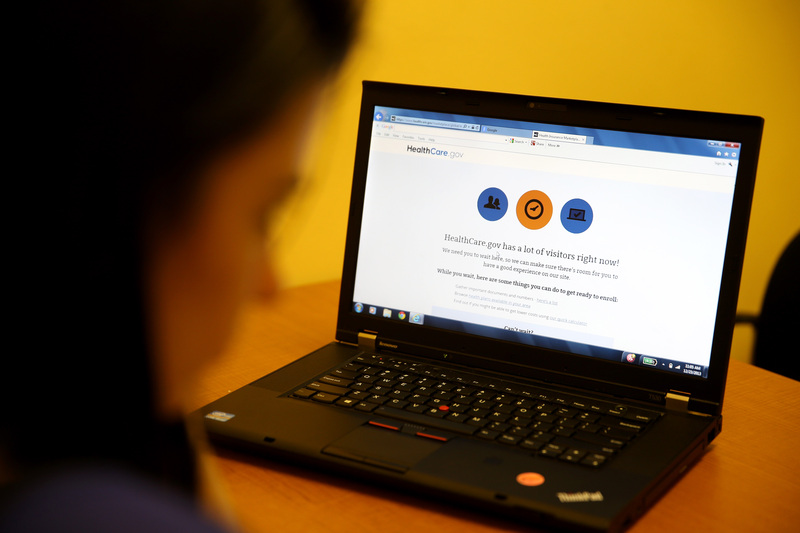 Deadline for Obamacare Enrollment Extended, and Healthcare.gov is Still Glitchy. Here we are again: I want to sign up for health insurance, but Healthcare.gov is overwhelmed with visitors. Granted, a lot has changed since the last time I wrote about my experiences with the federal health insurance marketplace. The site has vastly improved and enrollment has increased drastically. But when I really need to, I'm still not able to log in. My goal was to avoid waiting until the last possible minute to sign up for Obamacare. I tried; I really did. But here I am, a day before the new deadline of Dec. 24, still in Healthcare.gov limbo. I cannot log into the federal healthcare marketplace website, and — even though I'm grateful for the one-day extension — I'm mildly freaking out. Even though I've said it before, I'm very thankful to be getting health insurance. Though signing up for healthcare via the Affordable Care Act has been quite a roller coaster for everyone involved — its disastrous rollout is the Associated Press' top story of 2013 — I believe the system truly helps people like me: Honest, hardworking individuals who are experiencing reduced pay or hours, having difficulty finding full-time jobs, and simply can't afford high health care costs right now. It's a shame so few young people are signing up for Obamacare, because — despite my reservations — I think I'm getting a pretty darn good deal on health insurance. But I've been trying for weeks to sign up for healthcare. Won't you join me on my doomed journey? And to all you hogging the site right now: Hurry up, because I'd just like to get this over with. We left off with me being super frustrated with Healthcare.gov. I decided to give my sign-up efforts a little break. Hmm, OK. I'll try later. The site still can't verify my identity. Seriously? Seriously. I am officially 26 years old — and without health insurance. When I log onto Healthcare.gov, I keep getting the same error message. So I perform some advanced IT magic (i.e. repeatedly pressing the enter button in a furor), which directs me to another page. I'm advised to call what I'm assuming is a super-special phone number for super-special people who are having an identity crisis according to Healthcare.gov. I talk to a very nice lady who basically tells me that signing up for healthcare the worst possible thing I could be doing right now. She asks me some questions and tells me to refresh the page after we hang up. Too bad it still doesn't work. I'm finally allowed to enter the mystical land of Healthcare.gov. That's enough for one day. Despite my sticker shock when first looking at healthcare plan options, I'm ecstatic that my costs are MUCH lower than expected once I enter my income information. Some numbers for comparison: A plan that was estimated to cost me $258 per month is now only $92, thanks to a handy-dandy tax credit. Those who qualify can choose to apply all, some or none of their tax credits. The marketplace really does help choose the best plan for your needs. For example, I was looking for something with a low monthly premium and low prescription costs. But someone else may have completely different needs. If you are still unsure of which plan to choose, I'd suggest using the "Compare Plans" option on the website. It lets you get a clear picture of all your choices side by side. I put in a call to one of my doctors to confirm if she accepts a certain insurance. She does! Excellent. I'm all ready to finish my healthcare sign-up, when I'm hit with this sucker again. And again. And again. Apparently, everyone else is having problems too. Ugh. I'm assuming I'll be able to complete everything by tomorrow, if all goes according to plan. If not, you can find me curled up in my room avoiding anything that may prompt injury or illness. UPDATE- Dec. 24, 12:38 a.m.